Our last full day in Nova Scotia began with us meeting ourselves again. This time it was two educators, Joseph and Shelly, from Minnesota. Joseph is of my tribe and Shelly is a Swede. Their children, like Henna, are Swedish Jews. Like us they also love to travel, are easy to talk to, and we hope our paths cross again. Before meeting up with them I spied a pod of pilot whales who flirted a bit with the coast beneath our feet. 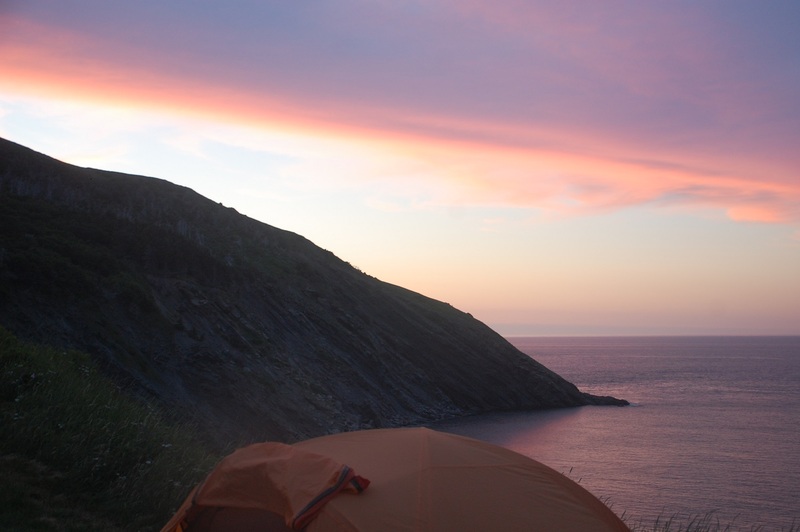 When I whispered “whales” into the tent it was the fastest I have ever seen the two sleeping princesses get up. 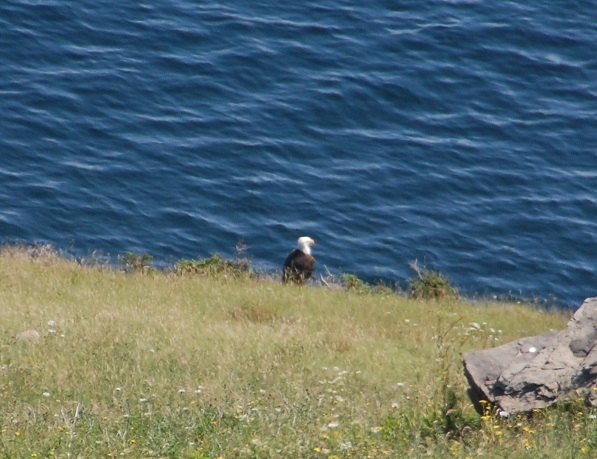 Later we hiked one of the many trails in Meat Cove to a grassy knoll where a bald eagle was hanging out. We exchanged blog information and then left for the mostly deserted beach. 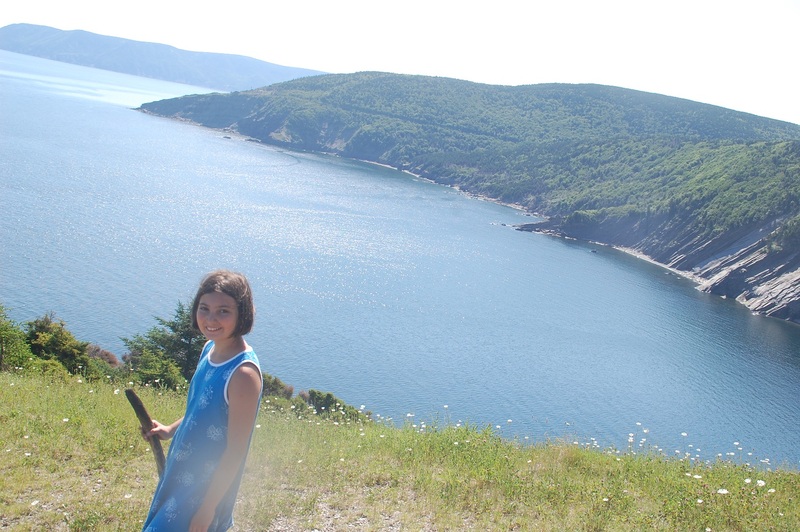 Later we drove to a much more crowded but sandy beach on Cape Breton’s west side. The second half of the day was a bit of a clean up for us; dishes, bodies, and laundry. The Cape Breton KOA left a little to be desired but we made more friends (this time a school principal, his wife the school’s secretary/librarian, and their very adorable two kids who are a bit younger than Henna). Jordan is actually the second school principal I have met camping in the last week (the other was an older gentleman from Quebec). At other campgrounds we have met occupational, physical, and speech pathologists along with a retired school superintendent who half-heartedly recruited me to work in Vermont and then practically salivated when he found out Corey is a speech pathologist. So you can be pretty certain that every teacher you have ever know is spending the summer camping. This entry was posted in 2014 Summer Trip: The Viking Within by hennacornoelidays. Bookmark the permalink. Wow!! What an amazing adventure you are having. Fun, educational, meaningful, wonderful! !